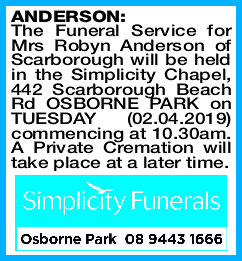 The Funeral Service for Mrs Robyn Anderson of Scarborough will be held in the Simplicity Chapel, 442 Scarborough Beach Rd OSBORNE PARK on TUESDAY (02.04.2019) commencing at 10.30am. A Private Cremation will take place at a later time. Passed away on 25th March from a stroke and complications. A beautiful ray of sunshine. 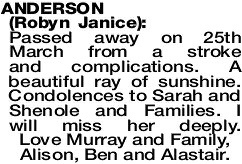 Condolences to Sarah and Shenole and Families. I will miss her deeply. 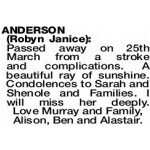 Love Murray and Family, Alison, Ben and Alastair. Don't have to be afraid. 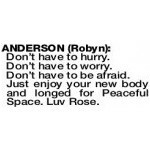 Just enjoy your new body and longed for Peaceful Space. Luv Rose.